Low carb Buffalo chicken dip is a popular low carb appetizer recipe for parties and gatherings. It’s easy to make and tastes like Buffalo chicken wings with creamy blue cheese dressing. I had buffalo chicken dip at a recent gathering. Admittedly, it was my first time trying it. Apparently, it’s been around f-o-r-e-v-e-r but I don’t get out much! The host graciously shared the ingredient list with me – it’s naturally low carb. 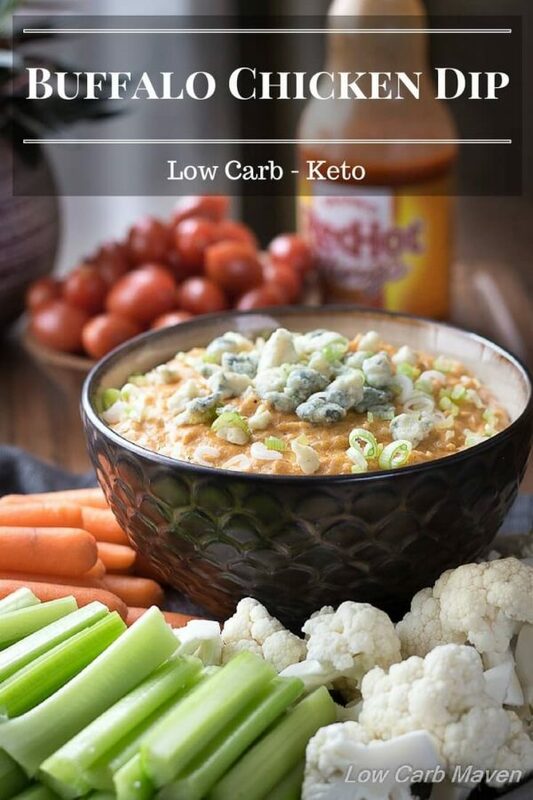 I researched many recipes before I began working on this low carb Buffalo chicken dip. Most recipes are the same, differing only in the “creamy” ingredients. Some recipes use ranch dressing, others use blue cheese dressing and still others call for mayonnaise and sour cream. Sounds great, but what’s in it? Buffalo chicken dip is made with shredded chicken, Buffalo sauce, cream cheese, a creamy dressing (or a combination of mayo and sour cream) and shredded cheese. The ingredients are combined and heated together before serving as a dip with the usual suspects as dippers. There are 4 ways to make low carb buffalo chicken dip. In The Microwave: Soften cream cheese in a medium-large microwave safe bowl or serving dish. Mix in creamy ingredients, then Buffalo sauce, until combined. Add shredded chicken and cheese and mix. Heat for two minutes, stir, then heat for another two minutes or until hot and bubbly and the cheese melts. Stir and serve. In The Oven: Mix softened cream cheese and creamy ingredients until smooth. Add the Buffalo sauce, mixing until incorporated. Stir in the shredded chicken and grated cheese and place the dip into an oven safe serving dish. Bake at 350 degrees F. until hot and bubbly, stir, then serve. In the Crock pot: Add softened cream cheese and all other ingredients into a crock pot. Cook on low for 2-3 hours or on high for 30 minutes to 1 hour or until hot and bubbly. Stir thoroughly, spoon into a serving dish and serve. 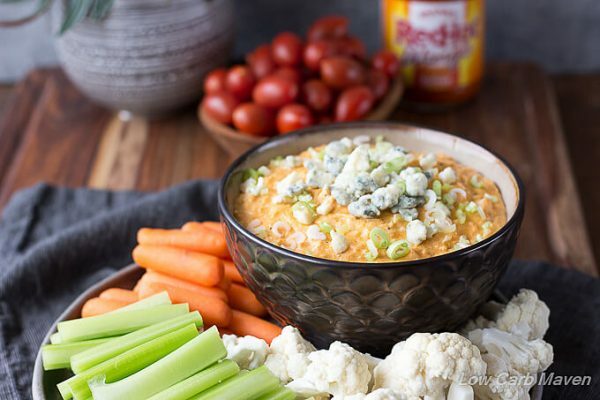 What to serve with Buffalo Chicken Dip? 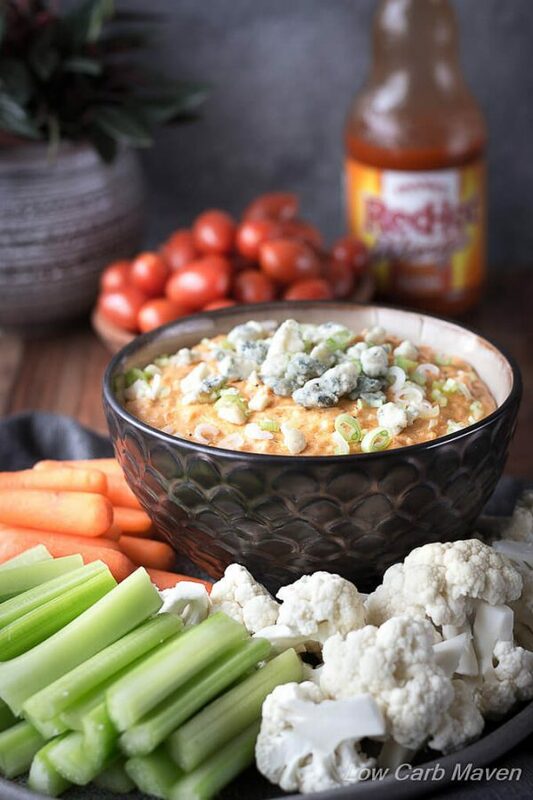 For your low carb guests, serve this Buffalo chicken dip with vegetables; carrots, celery and cauliflower. Any sturdy vegetable will do. For some, baked low carb tortilla chips made from low carb tortillas or low carb crackers will be a hit. For other guests, serve the dip with slices of French bread (toasted or un-toasted) or sturdy crackers and chips. I’ve seen a variation of Buffalo Chicken Dip served on a loaf of French bread topped with cheese, bacon, blue cheese and scallions. Like this Buffalo chicken dip stuffed French bread recipe from Carlsbad Cravings. This recipe went through many iterations before I settled on the ingredient combinations I liked the best. 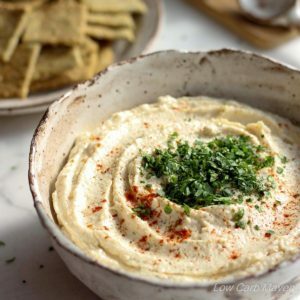 The dip is mild and creamy. Use spicy Buffalo Sauce for a spicy dip or add jarred jalapenos. I preferred adding the blue cheese to the top as a garnish instead of mixing it into the dip. It was too sharp or sour and the blue cheese flavor was lost. 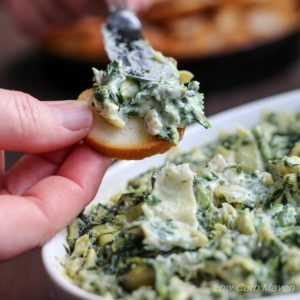 My family loved this dip and I hope you do, too! Low Carb Buffalo Chicken Dip is 2 net carbs per serving. 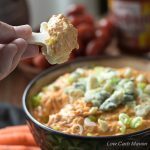 Low carb Buffalo chicken dip is a popular low carb appetizer recipe that's easy to make and tastes like Buffalo chicken wings with creamy blue cheese dressing. Melt the cream cheese and mozzarella in a medium frying pan or pot. over low heat. Stir in the Buffalo sauce, then shredded chicken. Add the ranch dressing and green onions, stirring until incorporated. Heat until the mixture is hot. Place in a warmed serving dish or in a small appetizer sized crock pot. Top with blue cheese and scallions. Makes about 3 1/2 cups with approximately 5 tbsp of dip per serving. For other cooking methods (oven, microwave, crock pot) see post. [NOTE] I suggest using rotisserie chicken or fresh cooked chicken breast. I tried using canned chicken in on of my recipes tests and it lacked a lot of flavor. Also, using blue cheese dressing instead of a good quality ranch dressing makes the dip taste overly sour and sharp. It's best to save the blue cheese as garnish over the top. Thank you, thank you, thank you! I made this just now on the stove. Took 10 minutes and it turned out absolutely amazing! So easy and simple and fits perfect into my keto macros! Kim, this was incredibly delicious! Thank you for sharing! I hate blue cheese so what should I substitute it with? I want to take this to a party. I can cook it there on the stove top but is there any part that can be mixed ahead of time so that I don’t have to take all the ingredients with me? Made this just now and OMG it’s fantastic. I used a homemade Ranch and a tad more Franks. Ate it with celery and mmm mmm mmm. I have made this several times, and I actually prefer it with blue cheese dressing (despite hating the taste of real blue cheese) It’s delicious either way, so I suggest trying both ways! I made this for the first time last week. It was really good on vegetables and pork rinds. I even put it on a low carb bagel the next day. Thanks! One of the better Buffalo Chicken Dips I’ve made. Good balance of flavors. A real winner. Kim, check this out……had your name written all over it. Looks like a marriage made in heaven of FatHead dough and Buffalo Chicken Dip (or Spinach Artichoke Dip).